Oh the horrible things you find in a dusty college photo album. 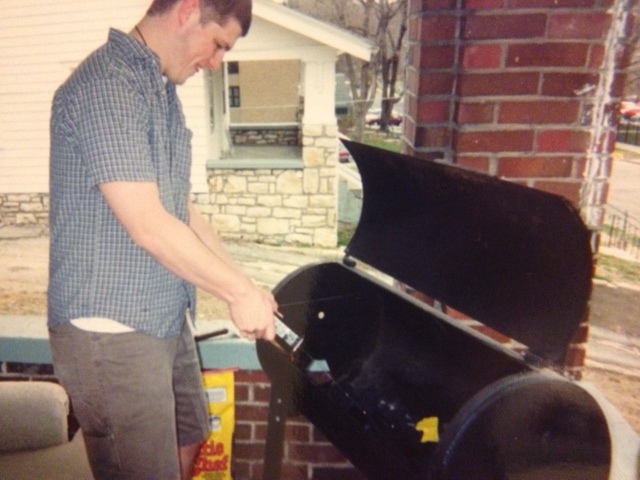 That’s definitely me and it was about 15 years ago that I apparently started a massive BBQ fire on the front porch of a very old rental house in a sketchy neighborhood adjacent to Rockhurst University. Who can spot the safety / BBQ fails here? 1. Squirting shitloads of fluid onto the coals. I guess I didn’t know about coal chimneys. At least it wasn’t lit. 2. BBQ on a narrow (maybe 6′ deep) porch… with a rotted wooden porch roof above it. Super not safe. 3. BBQ directly adjacent to an old outside couch? That couch is certainly dried out and full of mice nests and spilled hard liquor. Extreme fire hazard. 4. Looks like I’m treating a smoker as if it was meant to be a 500 degrees inferno. That’s probably good for killing the germs on our cheap-o unsafe discount meat for college age idiots that are drinking beers… but not so good in hindsight.